How Many Times...I was exhibited in "A Woman's Work" at Avisca Fine Art in Marietta, GA in March, 2010. 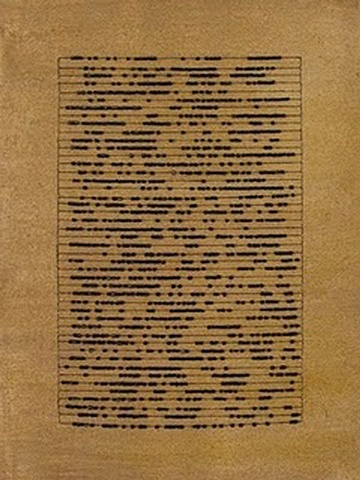 Max Eternity wrote, in the blackartproject.blogspot.com, "Chiang sews lines of colored beads on canvas, which are patterned in an orchestrated fashion, reminiscent of abacus arrangements." "...the attentiveness to detail in each of the pieces--the stillness and the silence--...she has an interest in architecture, anthropology and archaeology....she constructs "historical" micro-sites, literally weaving and building her paintings as discovered artifacts, grounding each piece into a place of permanence...the work is here and now but it also informs of some mysterious past."